The prompt to think about newspapers, though, dredged up something else from my memory. 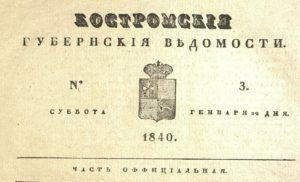 When I was first working on my PhD dissertation I spent quite a bit of time reading through many years of gubernskie vedomosti, the provincial newspapers that appeared through much of the Russian Empire in the late 1830s and 1840s. I was looking for materials on agriculture and food, but I also couldn’t help but notice that the newspapers contained frequent descriptions of “arrested vagrants” and “found dead bodies.” At the time I noticed these advertisements, showed a few of them to friends, but then just filed them away in my mind as a curiosity. Over the next many years I noticed them whenever I went back to those newspapers, always again to remember their existence, again think they were interesting, and again to file them away. Katia’s question brought them back to me—and because I had just spent the last several years thinking above all about soslovie and belonging and paperwork, I suddenly felt like I understood these advertisements as something more than just a curiosity. I realized that they were part of a larger process of controlling (or trying to control) movement and of policing social status. And so I suggested this as a paper, it was accepted, and that’s what I initially wrote up and presented at the conference. It talked mostly about those notices, and gave a bit of background on the creation of the gubernskie vedomosti during the reign of Nicholas I. My chapter in the book, though, is completely different. Katia and her co-editor, Simon Franklin, came up with a plan for the edited volume that asked more of us as contributors than simply to polish up our conference papers. Could I, they asked, give a fuller account of the history of newspapers in Russia up to the middle of the nineteenth century? I must admit, I considered saying I could not, in part because it felt like quite a different thing from anything else I’d been researching. But in the end I said yes, and I’m glad I did. I’m sure there’s still more to say about the subject, as I drew almost entirely on the Complete Collection of the Laws of the Russian Empire rather than archival documents. But even with just that as a source, I found a lot of material that showed quite clearly the many ways that Russia’s emperors and administrators worried about communications, and in particular what I came to call the problem of the provinces: how to get information out from the center and in from the provinces in a more efficient way. Newspapers promised a solution to this problem. Of course, newspapers, even the centrally established ones created to be organs of the state, turned out to be imperfect solutions. It wasn’t so much that they failed to disseminate information. It was instead that the information they disseminated wasn’t always in keeping with official ideals. I don’t mean that these provincial papers were filled with radical writings (though Alexander Herzen famously worked on the Vladimir newspaper for a while). Politics, after all, was the one subject that was explicitly forbidden from their pages. But as it turned out, information, even seemingly benign information about crops or prices or vagrants, was not apolitical, but instead could be read and interpreted in ways far beyond anything Nicholas I or his ministers might have imagined. Read Alison K. Smith’s chapter, ‘Information and Efficiency: Russian Newspapers, ca.1700–1850’ and more from Information and Empire here. This entry was posted in Author Posts and tagged 1600-1850, Information and Empire: Mechanisms of Communication in Russia. Bookmark the permalink.